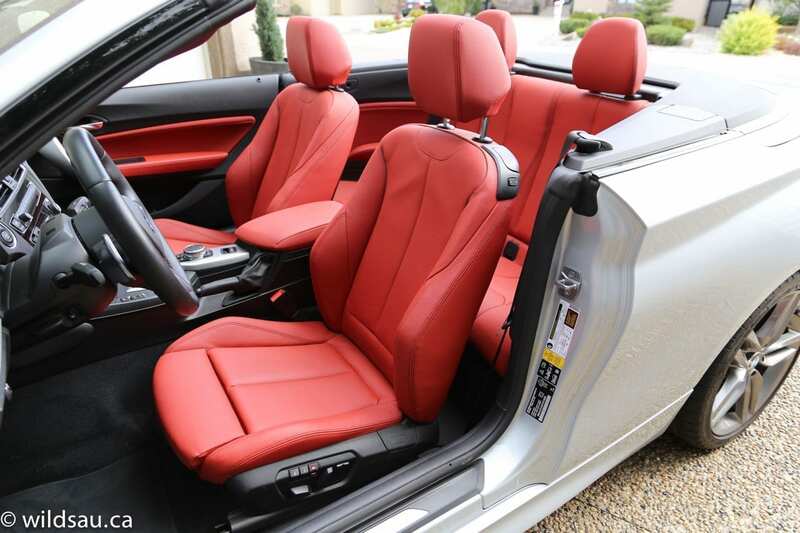 A slick little convertible that offers luxurious comfort, fun and sun. 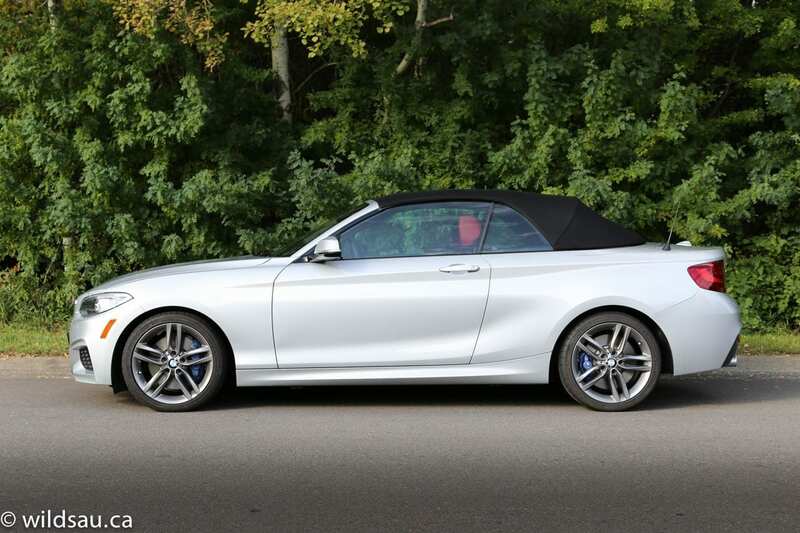 The 228i is a small convertible coupe. It is what used to be BMW’s 1-series, which further confuses people, many of whom just got used to what the 1-series was. Anyway, other than the all-electric i3, it’s BMW’s smallest 4-seater. And it has a ragtop. Make sense? It’s a good looking car, with simple and clean lines. Nothing extravagant, and just enough elegance and sportiness to catch your eye. In my opinion, this car looks good with the top up and with it down, and that’s no easy feat. My tester’s M Sport aerodynamics package come with noticeably different front and rear aprons, as well as special side sills and a rear spoiler. 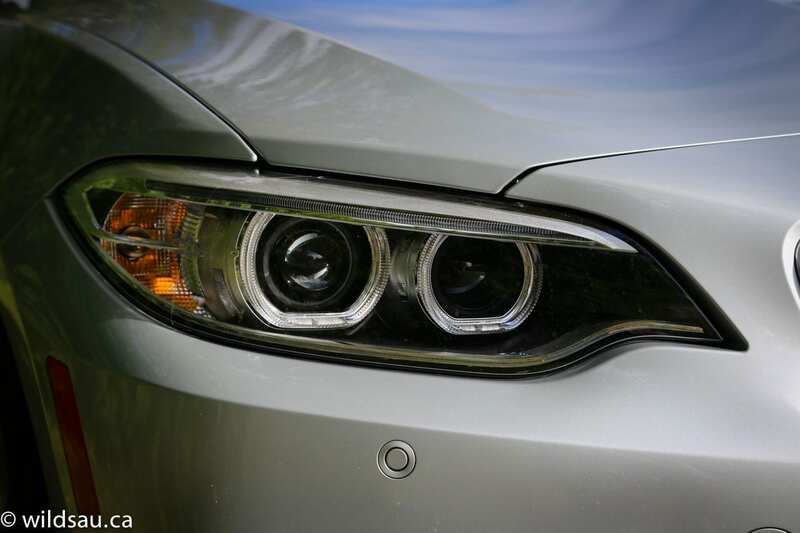 Up front, you’ll notice a pretty cool combination of angry eyebrows and corona rings as its driving light signature – it’s the new corporate face for BMWs and it looks great. This one also had super-bright bi-xenon headlights and the whole combination makes the front end look pretty aggressive. 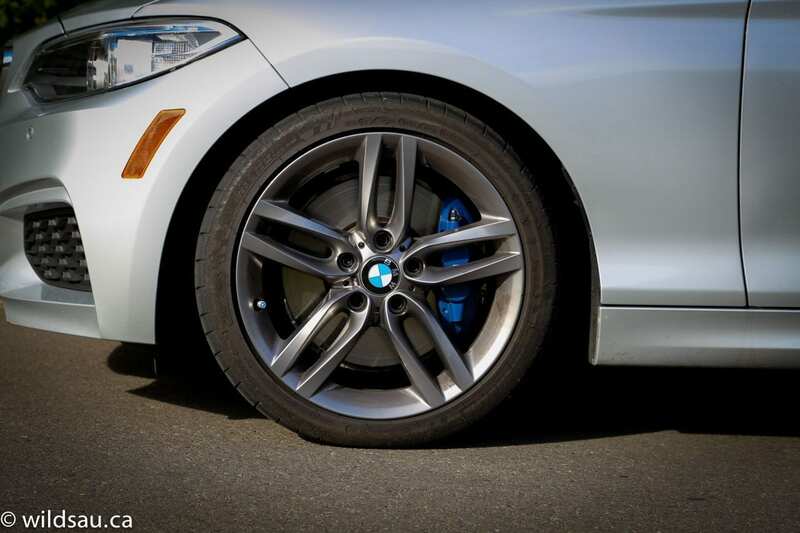 The 18-inch M Sport wheels with reasonably-sized sporty rubber look fantastic, as do the blue calipers peeking through the spokes. When I last reviewed a 3-series, nobody looked twice, but this car seems to be special and garnered a lot of second and third looks, top up or down. Inside, I found the materials are of a decent grade, and you’ll mostly come across soft-touch plastics throughout the cabin. It’s all black, so you’ll be grateful for the swaths of brushed metallic-looking trim to break up the monotony. 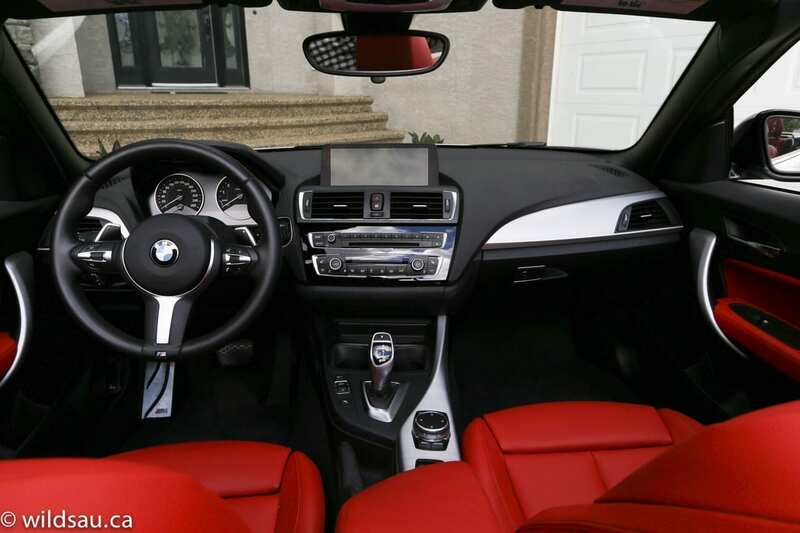 The heated three-spoke M steering wheel is simply a delight to hold, and the Coral Red Dakota leather sport seats are awesome. A perfect combination of comfort and outstanding bolstering. I’m not a fan of BMW’s iDrive system. I don’t find it user-friendly or intuitive, particularly the way the on-screen menus are laid out and accessed. The screen itself is a wide one and is lovely to look at. 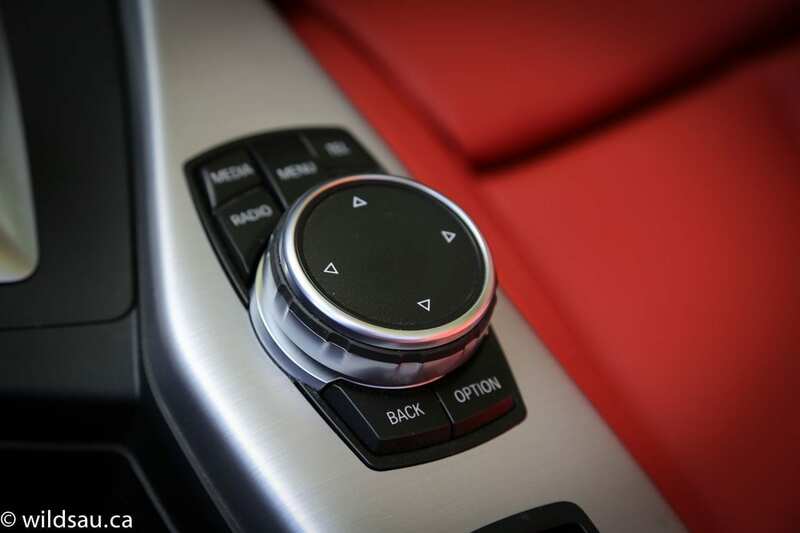 It hosts all the functions you’d expect – stereo, phone and navigation as well as BMW apps and vehicle settings. This car’s base stereo system wasn’t that great – I’ve heard the harman kardon upgrade and it would be well worth it in my opinion. The 228i gets a bit of driver assistance tech – a dynamic cruise control system and a rear view camera with front and rear parking sensors. I wouldn’t call them a complete write-off, but the 228 is clearly not designed around the rear seats. Getting into them is no fun for adults, and being there is no fun either. There are two seats and they are extremely cramped. Leg, foot and shoulder room are all at a premium, and I didn’t even have enough head room for my 5’10” frame. Add to that the nearly vertical seatbacks, and you’ve got a car that begs to be driven sans rear passengers. Even my kids weren’t big fans of having to sit back there, unless I put the top down – in that case the wind in their hair made up for the claustrophobic quarters. 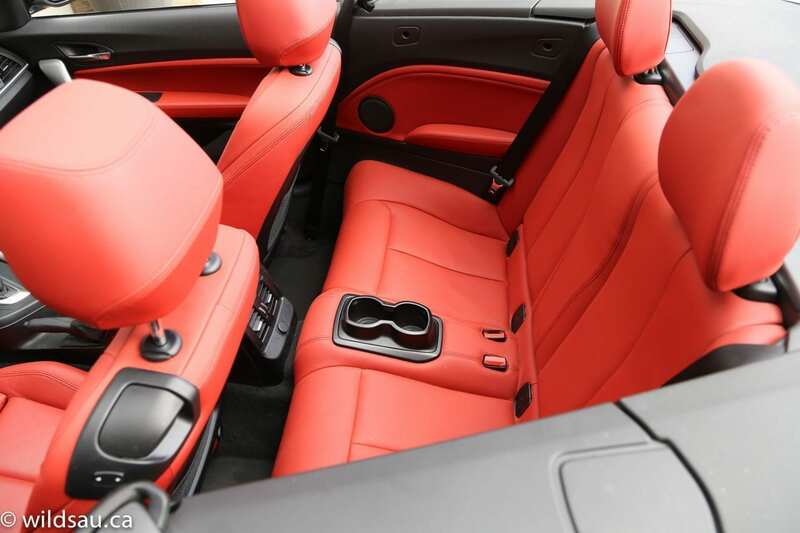 Ironically, you’ll find more convenience and comfort related goodies in the back than in some other vehicles that boast twice the space – the 228i has cupholders,adjustable air vents and a charging plug back there! It’s a small car, and so space for your stuff is obviously limited. I liked the rubberized storage bin on left underside of the dash but found the shallow drop-in bin at the front of the console not very useful due to its strange size. There’s also a little bit of space under the armrest lid, as well as USB and auxiliary plugs. It shouldn’t be a surprise then that the 335 litre trunk is small – you’re not buying one of these cars to help friends move into a new house. At the top of the trunk is a fabric shroud which is what the convertible top folds down into. 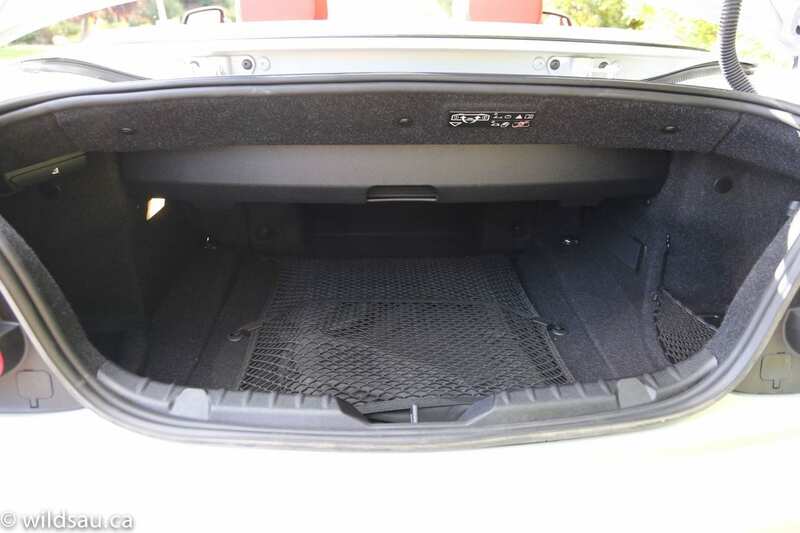 If you’re not about to drive with the top down, you can accordion that shroud up and out of the way, making significantly more space available in the trunk. The rear seats split 60/40 and fold down for some extra cargo space. 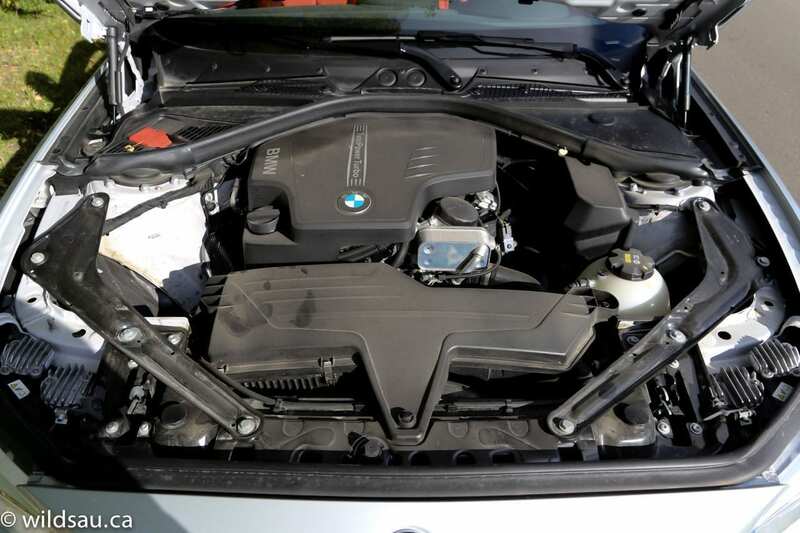 BMW’s ubiquitous turbocharged 2.0-litre 4-cylinder sits longitudinally under the hood. 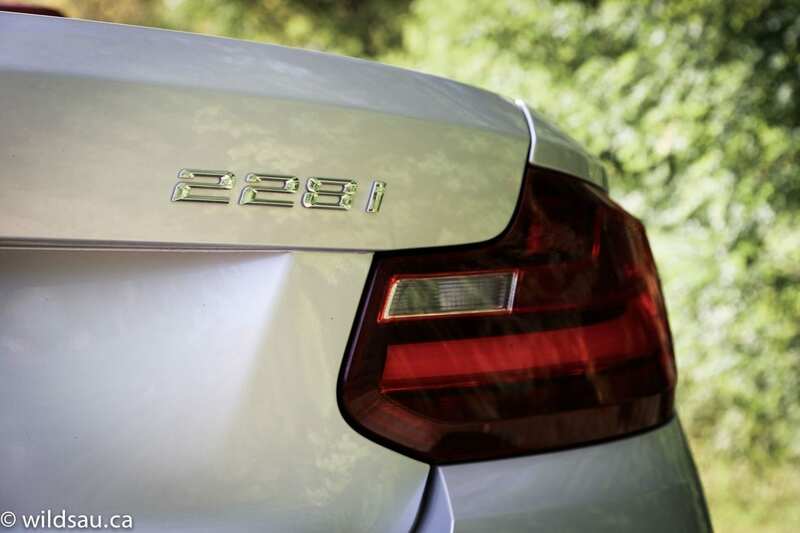 The numbers are familiar – 241 HP and 258 lb.ft of torque (which shows up at 1450 RPM). The power makes its way through an 8-speed automatic and on to all four corners thanks to the xDrive all-wheel drive system. Fuel economy is quite good – BMW says it will get 10.6 L/100 km (22 US mpg) in town and 7.2 L/100 km (33 US mpg) on the open road. I averaged 12.7 L/100 km (19 US mpg) driving with quite a heavy foot – mostly in town and a few freeway sprints. 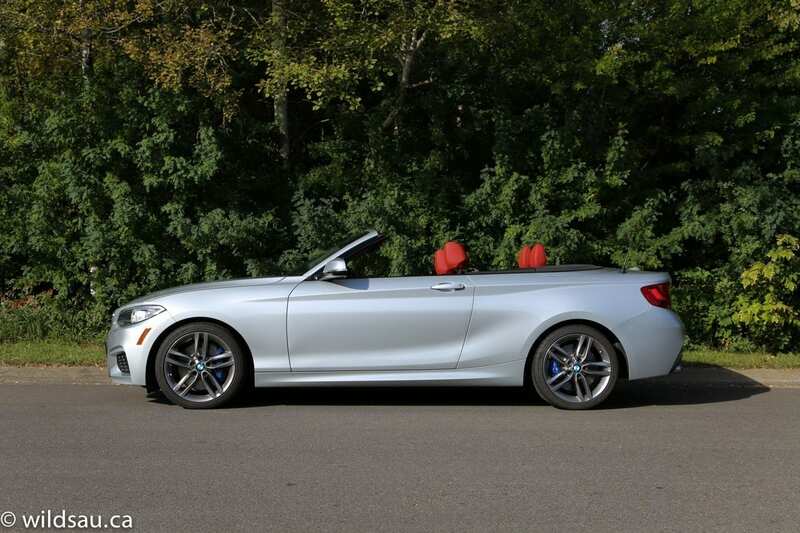 The 228i convertible weighs a surprisingly porky 3765 pounds (1708 kg). Yet off the line it feels relatively powerful – after a moment of lag. The acceleration is very linear so it’s not what I’d call thrilling but it is very competent when it comes to moving things along. Proof – it’ll make the 0-100 km/h sprint in 5.9 seconds. The 8-speed transmission is smooth and intelligent, but still felt like one of the biggest impediments to making the 228 a true sports car. If you are trundling along at a certain speed, and you hammer on it to tap into the power (to pass or show some douchebag what’s what), it takes a couple of seconds for the transmission to find its way through the eight gears. I found that a bit irritating, but once it does find the right gear, it’s great. It can be shifted manually with paddles or using the goofy shift lever if you want to do that kind of thing. There are four driving modes – EcoPro (which goes so far as to alter air conditioning use to save on fuel), Comfort (which is normal), Sport and Sport +. The latter two definitely transform the car and make it significantly more responsive. Not just in terms of the throttle and transmission – the adaptive M suspension tightens up and makes the already-good handling great. I enjoyed the variable sport steering which felt well balanced and sporty enough, without compromising the car’s comfortable and laid-back nature. Typical for a BMW, the ride is firm but comfortable. I occasionally found the short wheelbase causing the vehicle to porpoise and get a bit jouncy, but overall it’s just fine. And those M Sport brakes? They are tremendous and likely more than nearly anyone actually needs unless you’re headed to the track. 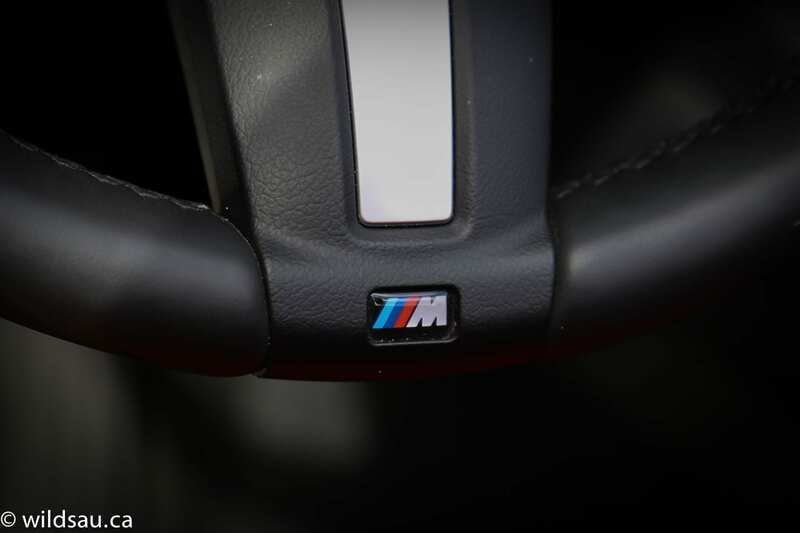 The all-wheel drive system didn’t get much of a workout during my time with the 228i – it was all dry-weather driving. With that said, its all-weather benefits likely outweight the fact that it dampens the car’s spirits a bit in the corners – I love the slight tail-happiness that a rear-wheel drive BMW offers when driven hard. You won’t find that here. One thing that threw me for a loop was that the 228i was pretty noisy, especially once you get up to 80 km/h or higher. At that point, the road noise gets significant and intrusive. I also found that the convertible top is not as well insulated for sound as others I’ve experienced, especially against ambient noise – like vehicles driving by you. With that said, there is only a little wind noise at higher speeds so they got that part right. The engine’s automatic start/stop technology kicks in a lot when you come to a stop – it didn’t bother me too much but it can be defeated if it annoys you. 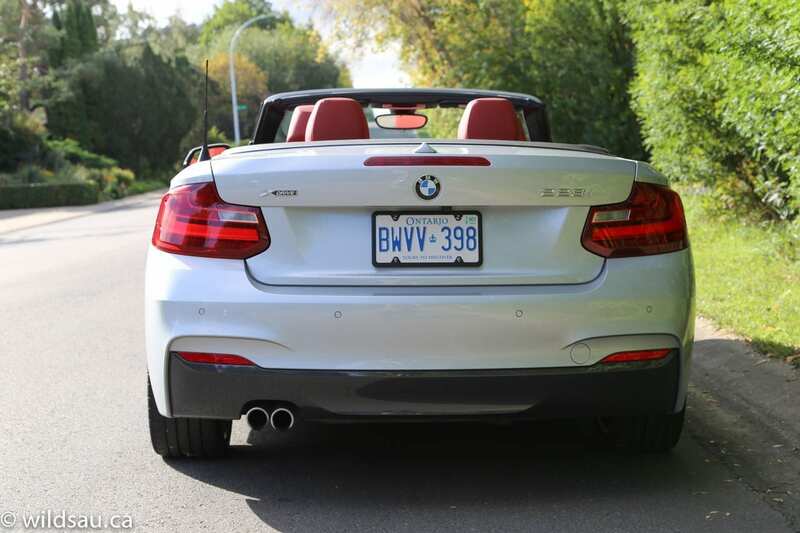 I thought that the 228i’s convertible top is quite slow – around 21 seconds for the up or the down cycle. Compared to the Mustang I was in this summer, which did the same thing in about 12 seconds. Comparatively, the BMW feels like it takes an eternity. The good part – it’s a completely hands-off experience, other than holding the power-top-button. No latches, no handles. And that’s nice. BMW includes a removable windscreen that reduces turbulence during top-down driving. It snaps into place behind the front seats, and swings up right behind the front headrests – which means you can’t have rear passengers when you’re using it. The screen folds down flat (and out of the way) as well. 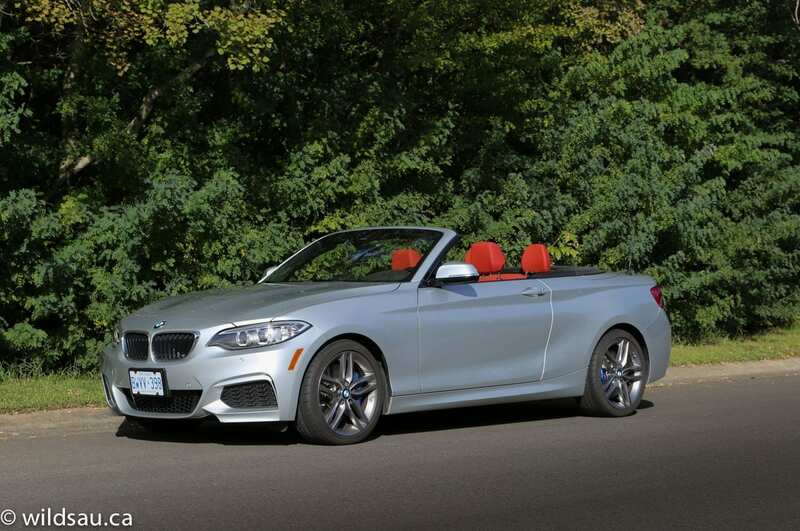 The BMW 228i Cabriolet is a nice easy-going convertible. Its relaxed nature is enjoyable and it doesn’t mind if you drive it hard. It’s not particularly thrilling when you do that, but I don’t think it is sold as an outright sports car. So I don’t knock the car for that. 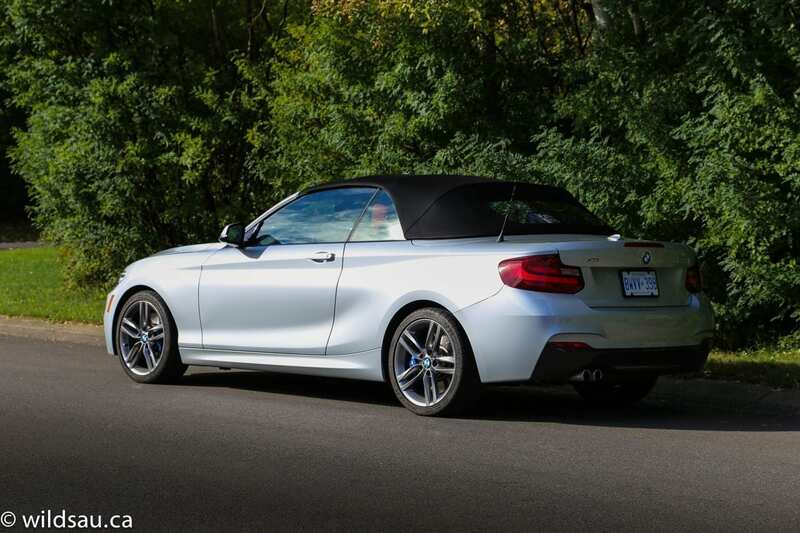 Hey, if you want more fun, get the M235i. That little beast will get your pulse moving in a hurry. WAF (Wife Acceptance Factor) was meh. She thought it was a bit cramped inside (she’s right), the trunk is basically too small for any of her shopping trips (she’s right) and it was a bit pricey (she’s right). I’ve just admitted my wife was right on three accounts – that should net me something, right? 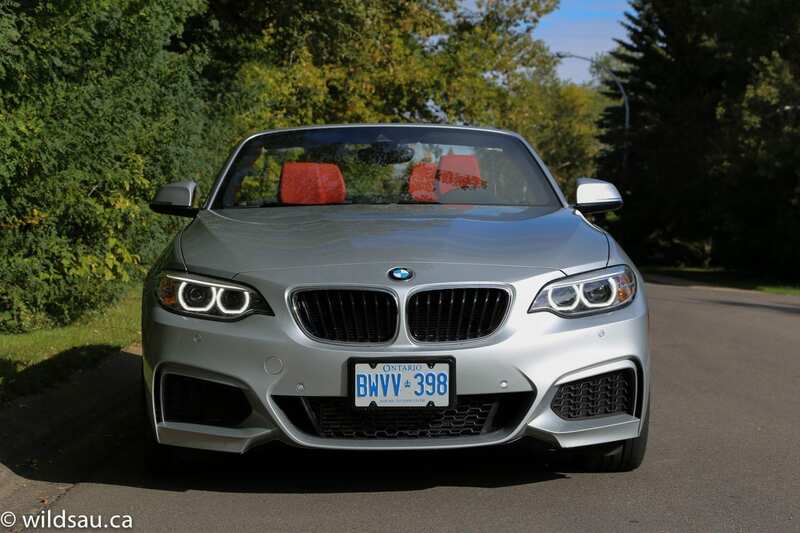 All in all, I really enjoyed the 228i Cabriolet for what it is, but if it were my money, I’d be saving a few dollars and getting the M235i. Forget the convertible and forget the all-wheel drive. And yes, I’ll take mine with a true manual transmission, thank you very much.